The Black Panther Party holds May Day demonstration to Free Huey in Detroit at the Federal Court House on Lafayette during May 1, 1969. (Photo: Leni Sinclair). 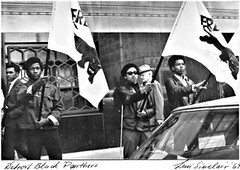 The Black Panther Party is not a black racist organization, not a racist organization at all. We understand where racism comes from. Our Minister of Defense, Huey P. Newton, has taught us to understand that we have to oppose all kinds of racism. The Party understands the imbedded racism in a large part of white America and it understands that the very small cults that sprout up every now and then in the black community have a basically black racist philosophy. The Black Panther Party would not stoop to the low, scurvy level of a Ku Klux Klansman, a white supremacist, or the so-called "patriotic" white citizens organizations, which hate black people because of the color of their skin. Even though some white citizens organizations will stand up and say, "Oh, we don't hate black people. It's just that we're not gonna let black people do this, and we're not gonna let black people do that." This is scurvy demagoguery, and the basis of it is the old racism of tabooing everything, and especially of tabooing the body. The black man's mind was stripped by the social environment, by the decadent social environment he was subjected to in slavery and in the years after the so-called Emancipation Proclamation. Black people, brown people, Chinese people, and Vietnamese people are called gooks, spicks, niggers, and other derogatory names. What the Black Panther Party has done in essence is to call for an alliance and coalition with all of the people and organizations who want to move against the power structure. It is the power structure who are the pigs and hogs, who have been robbing the people; the avaricious, demagogic ruling-class elite who move the pigs upon our heads and who order them to do so as a means of maintaining their same old exploitation. In the days of worldwide capitalistic imperialism, with that imperialism also manifested right here in America against many different peoples, we find it necessary, as human beings, to oppose misconceptions of the day, like integration. If people want to integrate - and I'm assuming they will fifty or 100 years from now - that's their business. But right now we have the problem of a ruling-class system that perpetuates racism and uses racism as a key to maintain its capitalistic exploitation. They use blacks, especially the blacks who come out of the colleges and the elite class system, because these blacks have a tendency to flock toward a black racism which is parallel to the racism the Ku Klux Klan or white citizens groups practice. It's obvious that trying to fight fire with fire means there's going to be a lot of burning. The best way to fight fire is with water because water douses the fire. The water is the solidarity of the people's right to defend themselves together in opposition to a vicious monster. Whatever is good for the man, can't be good for us. Whatever is good for the capitalistic ruling-class system, can't be good for the masses of the people. We, the Black Panther Party, see ourselves as a nation within a nation, but not for any racist reasons. We see it as a necessity for us to progress as human beings and live on the face of this earth along with other people. We do not fight racism with racism. We fight racism with solidarity. We do not fight exploitative capitalism with black capitalism. We fight capitalism with basic socialism. And we do not fight imperialism with more imperialism. We fight imperialism with proletarian internationalism. These principles are very functional for the Party. They're very practical, humanistic, and necessary. They should be understood by the masses of the people. We don't use our guns, we have never used our guns to go into the white community to shoot up white people. We only defend ourselves against anybody, be they black, blue, green, or red, who attacks us unjustly and tries to murder us and kill us for implementing our programs. All in all, I think people can see from our past practice, that ours is not a racist organization but a very progressive revolutionary party. Those who want to obscure the struggle with ethnic differences are the ones who are aiding and maintaining the exploitation of the masses of the people: poor whites, poor blacks, browns, red Indians, poor Chinese and Japanese, and the workers at large. Racism and ethnic differences allow the power structure to exploit the masses of workers in this country, because that's the key by which they maintain their control. To divide the people and conquer them is the objective of the power structure. It's the ruling class, the very small minority, the few avaricious, demagogic hogs and rats who control and infest the government. The ruling class and their running dogs, their lackeys, their bootlickers, their Toms and their black racists, their cultural nationalists - they're all the running dogs of the ruling class. These are the ones who help to maintain and aid the power structure by perpetuating their racist attitudes and using racism as a means to divide the people. But it's really the small, minority ruling class that is dominating, exploiting, and oppressing the working and laboring people. All of us are laboring-class people, employed or unemployed, and our unity has got to be based on the practical necessities of life, liberty, and the pursuit of happiness, if that means anything to anybody. It's got to be based on the practical things like the survival of people and people's right to self-determination, to iron out the problems that exist. So in essence it is not at all a race struggle. We're rapidly educating people to this. In our view it is a class struggle between the massive proletarian working class and the small, minority ruling class. Working-class people of all colors must unite against the exploitative, oppressive ruling class. So let me emphasize again - we believe our fight is a class struggle and not a race struggle.